How can you fix a problem without knowing what the problem is? Power quality is a study of the electrical environment of a facility from the power sources through the electrical loads or end users. The testing procedures include collecting data over a period of days of the voltage, frequency and current flowing in the system. 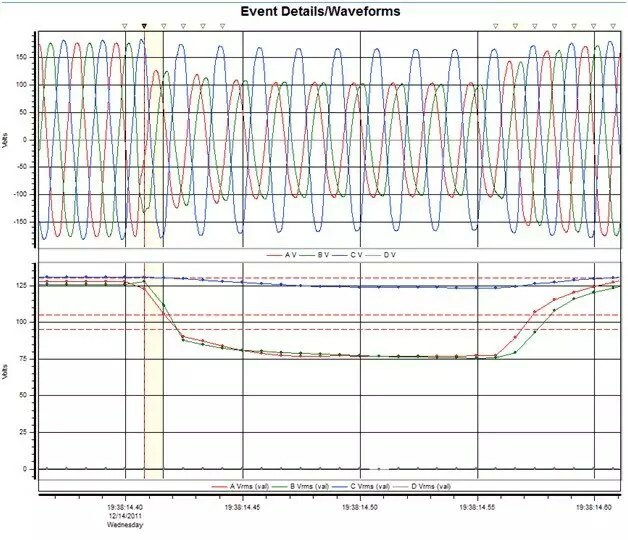 “Events” or abnormalities outside of the normal tolerances of voltage, frequency and current are separately indicated from the data to highlight problems. “Events,” such as low voltage (SAG) and over voltage (SWELL), are extremely dangerous abnormalities. The frequency and magnitude of these “events” determines the recommended solutions to fix them. “Earth” grounding is essential to proper safe electrical system performance. Testing the earth resistance allows the engineer to make recommendations to improve this function so that other protective devices will work properly. The electrical power environment in the developing world is deteriorating due the lack of funds to purchase new equipment and maintaining existing, poor training and lack of appropriate test equipment for national utility personal, and an ever increasing demand for electricity. The result is extremely poor power quality in the form of outages, brownouts, and transients of overvoltage due to disturbances on the power lines. This electrical environment destroys medical equipment. Alternative energy sources such as diesel generators sets, hydroelectric plants, solar electrical systems and storage devices such as battery inverters unit can provide solutions to the transitional utility electrical power source. Obviously, the diesel generator set uses fossil fuels which lend themselves to purchase , transportation, and maintenance issues. The average cost of producing electrical power by diesel generator set is $0.28/ KWHr. A small rural hospital using 240 KWHr per day averaging 10 KW of constant usage can expect a cost of nearly $70 per day. The math is daunting as the hospital grows in size and electrical power needs. In order to cut the run time of the diesel generator set to manageable cost and maintenance, the installation of a battery inverter system will store electrical energy in batteries and then return that energy to the system through a DC/AC inverter when the diesel is not running. Normally, this reduces the run time of the diesel by a factor or 50%. Solar, wind turbine, and hydroelectric power sources reduces or eliminates the dependency on the traditional electric utility source. Each of these sources are site specific and must be carefully evaluated for each applications. See the article which elaborates on each source. Diesel Generator sets have been the backbone of standby electrical power and in some remote locations the primary electrical power source for facilities around the world for many years. Battery Inverter systems can provide CLEAN and Uninterruptible Electrical power to areas of a facility with sensitive electronics. The solar controllers and inverters are very reliable and the lifespan of a PV panel is 25 years. The cost of these items has dropped dramatically in the past 5-7 years.